Peaceworks: Nuclear News? What is the Take-Home Lesson? Nuclear News? What is the Take-Home Lesson? There’s a news story you may have heard, but likely didn’t, as it’s not been very widely reported. Like many stories, it has various lessons to offer. In fact this story is kind of a Rorschach Test, as it is likely to yield very different messages, depending upon one’s headset. How does one react to a story that warns that the Russians might send nuclear-armed, drone mini-subs into U.S. waters and blow Boston, New York, Philadelphia, Washington DC and dozens of other cities off the map? While a lot has happened over the past half century, it seems that rulers still need enemies and so does the Military Industrial Complex, so we are still encouraged to see the “Ruskies” as boogey men. So, yes, the notion of drones delivering massive thermonuclear bombs destroying American cities is a horrible thing to contemplate; one that many might, without thinking too hard, see as demonstrating the inherent barbarian nature of our supposed adversaries. And, yes, the thought of deploying weapons that target cities and threaten to kill millions, is unsettling, at best, and an outrage beyond comprehension if one isn’t totally numbed. But, wait a minute, targeting cities for annihilation? This is exactly what the U.S. has done for decades with its enormous nuclear arsenal. The so-called “Balance of Terror” in a system of “Mutually Assured Destruction,” has always been about as immoral as one can imagine; threatening to annihilate hundreds of millions in the blink of an eye. Further, our government has repeatedly refused to repudiate first use of nuclear weapons and has resisted treaty obligations to eliminate nuclear arsenals. And, don’t forget that the United States is the only nation that has ever used nukes. In 1945 the U.S. military incinerated two Japanese cities, Hiroshima and Nagasaki, killing hundreds of thousands, using primitive, first-generation nuclear weapons (Today’s thermonuclear bombs are several orders of magnitude more destructive). So, how does the United States claim the mantle of morality in this nuclear business? Why did the Russians decide to build drone subs to deliver these Doomsday devices? Well Popular Mechanics has an answer to this, “Russia is thought to have conceived of Status-6 as a response to America's missile defense system.” That’s right, it’s our government’s own actions—its unwillingness to negotiate an arms control agreement that would ban destabilizing “Star Wars”-type systems that led the Russians to pursue this new mode of delivering massive death and destruction. Ever since the 1980s the United States has been taking actions that destabilize the “Balance of Terror.” And, under President George W. Bush, our government withdrew from the Anti-Ballistic Missile (ABM) Treaty, over Russia’s loud protestations. More recently, under President Obama, the U.S. initiated a one-trillion dollar program of “modernization,” which includes the development of more accurate delivery systems that provide the capability for launching a decapitating first strike. The U.S. has not only pushed the expansion of NATO into Eastern Europe, putting NATO troops right on Russia’s borders, it has also been aggressively building so-called “missile defense” facilities in both Poland and Romania. Our government claims these installations are directed at Iranian missiles, but this strains credulity. As long as the United States insists on maintaining a nuclear arsenal in perpetuity, we will not be free of the threat of nuclear annihilation. The United States and all nuclear weapons states (NWS) are obligated, under the 1968 Non-Proliferation Treaty to eliminate these arsenals. According to the Arms Control Association, “Article VI commits the NWS to ‘pursue negotiations in good faith on effective measures relating to cessation of the nuclear arms race at an early date and to nuclear disarmament, and on a treaty on general and complete disarmament under strict and effective international control.’” No one really believes that 49 years represents action at an “early date,” but, more on point, U. S. strategic doctrine calls for maintaining and “upgrading,” not eliminating, its arsenal and its dominant nuclear posture. Those of us who lived through the 1962 Cuban Missile Crisis or the intense nuclear saber-rattling of the first term of the Reagan administration know what it’s like to feel viscerally the threat of nuclear annihilation. Younger readers likely view this threat in more abstract terms. Either way, however, we are almost all living with some level of denial. It is high time that we recognized that we are not invulnerable. 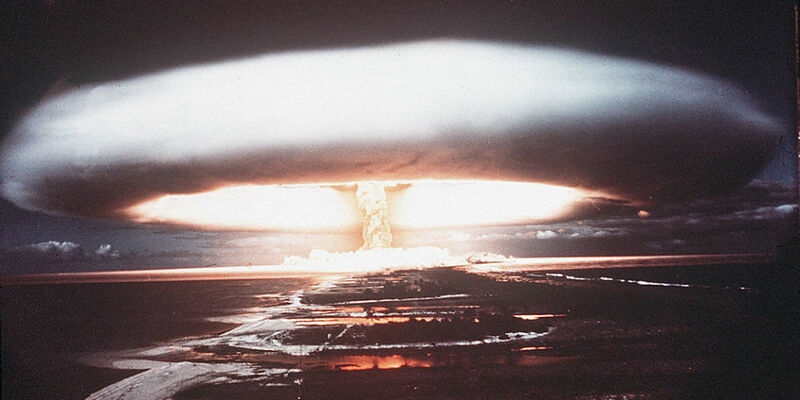 In fact, unless nuclear abolition is pursued and achieved, we are virtually guaranteed that at some point—be it by malfunction, miscalculation, misperception, mental illness, irrational, ideologically-driven responses to crises, etc.—that the world, or at least the human race and most of the other species we share the Earth with, will be lost to nuclear war. There is some hopeful news, however. A United Nations conference that begins later this month will be focusing on drafting a treaty to ban nuclear weapons, along the lines of conventions banning chemical weapons or landmines. While this, alone, won’t eliminate the nuclear threat, it holds the potential for generating new momentum to drive forward the movement for nuclear abolition. We, here at Peaceworks, find the current situation absolutely unacceptable and thus we are redoubling our efforts to make sure that the issue of nuclear weapons is addressed. To us, the take-home lesson is that our government urgently needs to work for mutual, verifiable, phased reductions of all nuclear arsenals on the road to nuclear abolition. We invite you to join us in making sure that nuclear disarmament is out, front and center, as an urgent concern. The alternative is too ghastly to accept.